Happy OFFICIAL Halloween, everyone! Although today is the actual true Halloween, all our festivities took place on Saturday. We had Trick or Treat Saturday evening (and had to make an emergency run to Walgreens to get extra candy after nearly running out in the first hour! ), and once that ended, Eric and I changed into our costumes for grown-up Trick or Treat (which, essentially is just bar hopping around Bay View). So, what were our costumes? 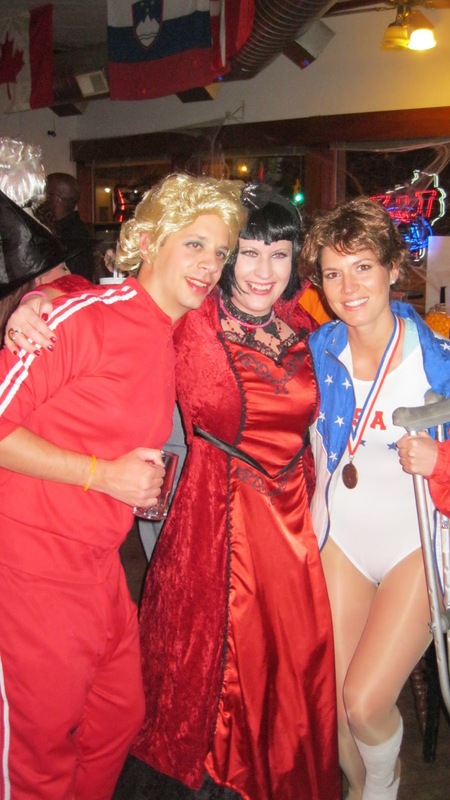 I was none other than Olympic hero Kerri Strug, member of the 1996 "Magnificent Seven" gymnastics team, who, up against an incredible injury upon her final vault, stuck the landing and clinched the gold for Team USA. 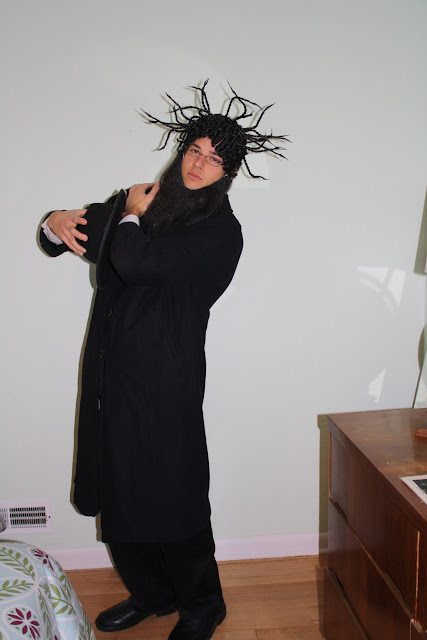 I had such a fun time with my costume. I bought the leotard and then used iron-on lettering for the USA and stars. The wig was actually a Donald-Trump wig that I took some scissors to and cut to look more like Kerri's hair. 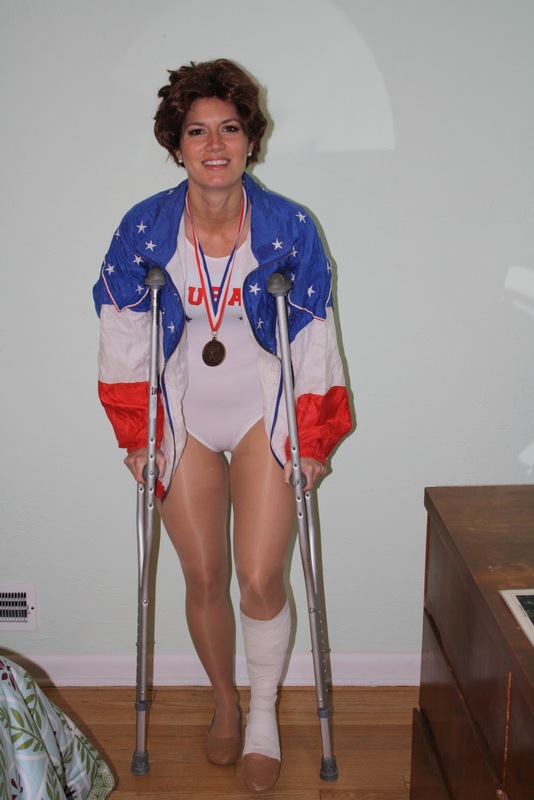 I was also happy to use an authentic medal I'd won when I was a gymnast years ago (hence, why the idea of dressing as Kerri Strug was so appealing tome). The windbreaker and crutches were purchased for $3 each at a local thrift store. Thankfully, it all came together very easily! So many people came up to me telling me how much they enjoyed it. Though I did get a few people who asked if I was Nancy Kerrigan, quite a few others knew who I was instantly. 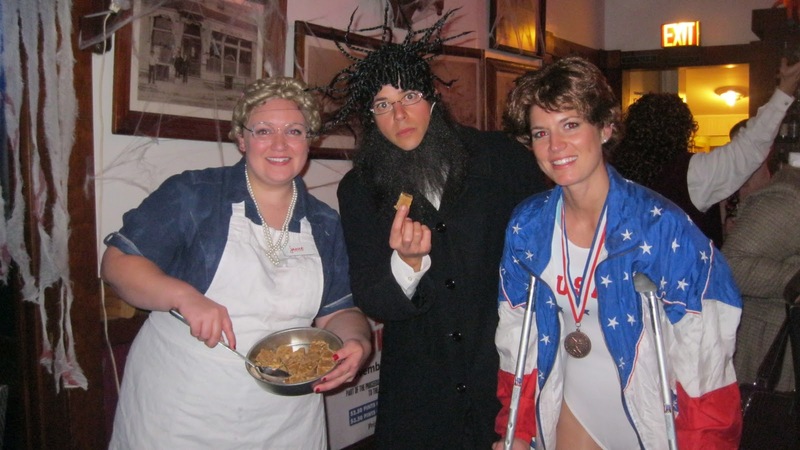 As for Eric, he also went the mid-1990s route and dressed as Weird Al Yankovic from the "Amish Paradise" video. While I would've preferred him going as my Bela Karolyi, he had his heart set on this costume, and I thought he pulled it off very nicely. Any bar we went that had a digital jukebox, he ordered "Amish Paradise" to play, and walked around singing it to everyone. He got plenty of laughs. While I loved both our costumes, there were a few others that I liked, as well. 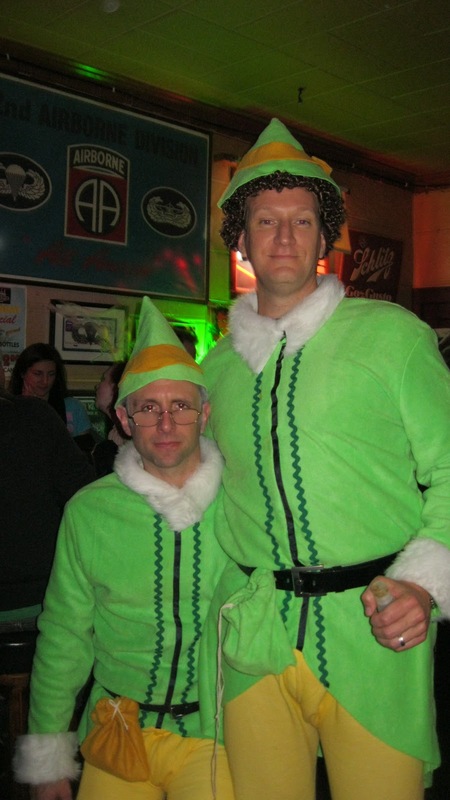 While I've seen Buddy the Elf done quite a few times before, this Buddy, and his Papa Elf, carried around their own little bottles of maple syrup, which was a nice touch. This was probably my favorite costume I saw of the night. Sure, you see Forrest Gump all the time at Halloween, but the Lieutenant Dan costume was just so spot-on. And the real kicker? 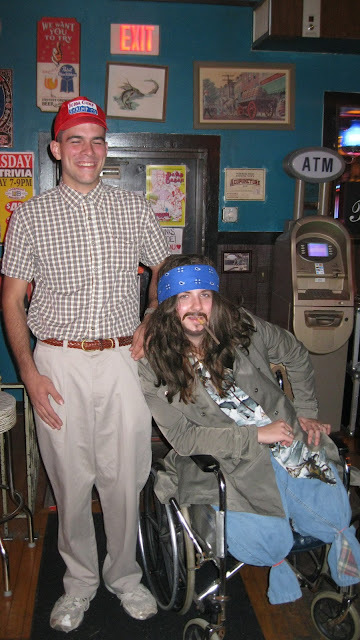 Lieutenant Dan was a girl!She did such a good job with her costume. Sue Sylvester and this... vampire woman? 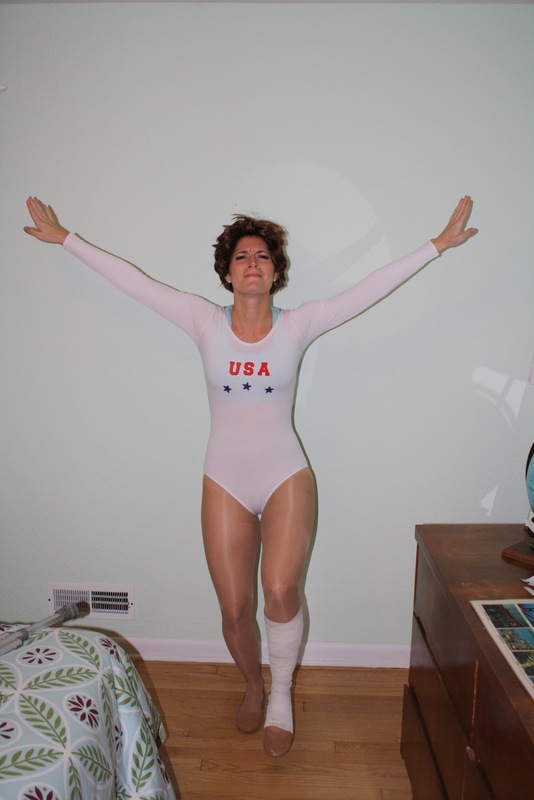 Were very excited about my Kerri Strug costume. They kept coming up to me all night exclaiming how much they liked it. So, of course, we needed a picture together. We were particularly happy about this Lunch Lady costume - not only because she put it together so well, but that her "mystery meat," as she called it, was some of the most delicious pumpkin fudge I've ever tasted. Bonus points for serving treats! 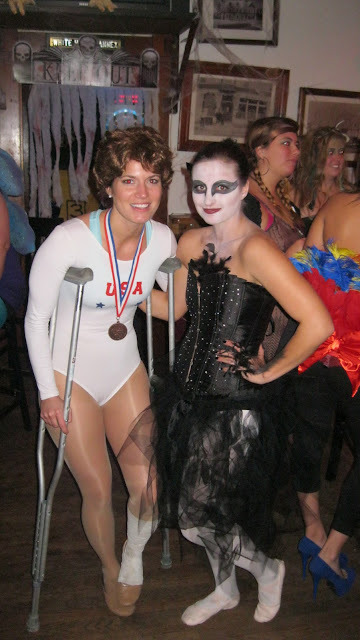 I loved this girl's Black Swan costume. She really looked a lot like Natalie Portman from the film. She said she never dressed up for Halloween, but threw this costume together at the last minute - I was impressed! Finally, this guy had a really intricate, homemade suit made entirely of PBR cans. I gave him two thumbs up for creativity and for putting all that work into it! There' always such an excited build up to Halloween each year, I get so sad when it's over. I figured out my costume all the way back in April, so I couldn't wait to actually put the idea into action! I don't know how I'll top this idea next year, but the planning process usually begins in the beginning of the year, so I hope I can come up with something great. What did you dress up as for Halloween? What was the best costume you saw? 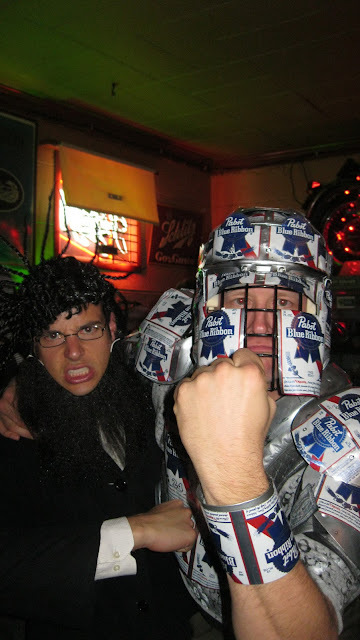 You and Eric both had hilarious and most excellent costumes, but WOW, PBR costume guy REALLY had it goin' on! Clever costume idea! I just found your blog via pinterest. I'm liking it so far, I always get so happy when I see a Milwaukee blogger :-) I live in Chicago but am from Milwaukee & am 95% certain that I'm moving back there for a job.